It’s been a good long while since I posted on Friday Reads. So much has happened. My third book, SnowGlobe Reunion released and I’m busy writing my fourth to be titled Harvest Blessings. I’ll be sure to keep you posted when it releases. In the meantime, I recently read a book in a genre that I haven’t much explored. I loved it so much I thought I’d share it with you in case you’re looking for a new genre too. The Widow’s Maestro by Sandra SooKoo was so different from what I’ve been reading that I found myself completely caught up in the story. This love story involves a new to me heroine – a woman thirteen years older than the hero. Set during Victorian times, society, and Josephine Prescott herself, expect women to be proper Victorian ladies. But as Josephine finds out, she can only protest so much before she becomes enamored by the hero, the golden haired Benedict Fitzgerald, our Victorian bad boy. Benedict Fitzgerald is a talented pianist maestro and you know how alluring and mysterious musicians can be. But to top it off he’s looking for a new lover and feels the older woman is fair game. Age difference, scandalous in those times, no longer matters as the two come to realize that stolen moments just aren’t enough.But there are just too many factors in this romance that prevent the two coming together for anything more so it seems. I won’t share anymore of this steamy, page turner but I hope you might be interested enough to pick it up for your weekend reading. Beyond the story, what I loved is Ms. Sookoo’s incredible gift for words. There are writers and there are, for me, wordsmiths. The writing industry has become entrenched in numbers and ranks often resulting in words but not craft. But Ms. Sookoo is a wordsmith, an artist gifted with a way of stringing together just the right words to create incredible scenes and lush colorful images. This romantic story played out in my head, like a movie. I could envision the luxurious gowns of the time period, the beautiful heroine and the incredibly good looking hero. Ms. Sookoo makes every detail in her book come to life on the page, something not every author has accomplished. There you have it. 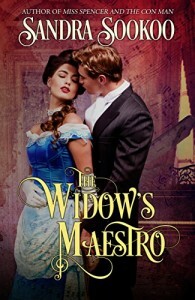 My Friday read and my recommended book to you if you’re looking for a steamy, romantic read for one of these last few weekends of the summer. If you read it, please stop by and let me know what you think. And I’ll catch you again on my next Friday Reads post.